Today is March 1st and it can only mean one thing. March Madness is upon us. Yes, the tournament that gets everyone in the office filling out their brackets with the hope of winning the office pool is almost here. Last year some of those offices decided to step it up a notch and play for not only pride, but for the Armchair Big Man trophy. A trophy that is tailor made for March Madness enthusiasts. I think you have to agree that this guy exudes basketball knowledge. 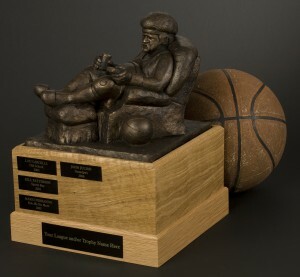 A college basketball Buddha of sorts. The only question you need to ask yourself is if your March Madness office pool is worthy.